All York Prestige rooftop units are designed to save time, money and materials by fitting directly on existing competitive curbs without the need for a transition curb. The compact Prestige cabinet is available with hail guards and hinged panel options in two heights and footprints to provide a quick and simple solution when replacing competitive rooftops ,With cooling ratings of up to 15 SEER (12 EER) for ENERGY STAR qualified products, Prestige™ rooftop units cut energy costs as much as 40% compared to older units. And you get even more savings whenever outdoor air can be used for cooling thanks to optional economizers incorporating low leak capabilities that meet ASHRAE 90.1-2010 standards—an industry energy efficiency benchmark for commercial heating and cooling equipment. Conventional rooftops use out moded electro mechanical controls that can’t provide the precision and trouble-free operation of the digital York Simplicity SE Smart Equipment controls—the integrated control package is standard with every Prestige rooftop unit. Microprocessor controls are easier to setup and commission thanks to the easy-to-view digital LCD readout and a convenient USB interface that simplifies installation, data transfer and troubleshooting.A harsh 1,000-hour rated salt spray testing confirms that the powder paint exterior finish on York Prestige™ rooftop units is superior to competitor’s pre-painted steel that leaves metal edges exposed to corrosion. The Prestige™ cabinet’s top panel is embossed for added strength to prevent vibration and flexing during handling, just as our base rail material is stronger to withstand wind and provide the highest seismic (earthquake) certification ratings. Every Prestige rooftop unit comes with a factory tested scroll compressor using a proven design with fewer moving parts and with high-temperature and high-pressure protection for higher reliability. Indoor and outdoor fans are dynamically balanced for better performance and reliability. Strict component selection and rigorous testing on the manufacturing line ensure top performance from every unit. Prestige rooftop units utilize R410A, the new-generation refrigerant that is not only safer for the ozone layer—it actually absorbs and releases heat more efficiently to save more electricity and reduce the facility’s carbon footprint. You’re covered with all the popular options that today’s rooftop units require: hail guard or hinged panel options, economizer and fresh air and relief damper options, three static drive options for airflow versatility up to 2" ESP, as well as options for 2" or 4" air filters, and coil coatings. 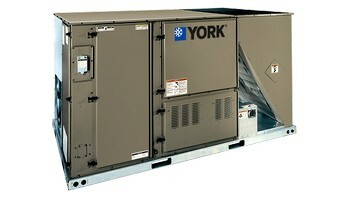 Power and unpowered convenience outlets, disconnect switches, as well as smoke and CO2 detectors, are also available,With two cabinet heights and two footprints sizes, York® Prestige™ rooftop units fit directly on the existing curb of your old rooftop unit—avoiding material, labor and height restrictions commonly encountered with replacement units requiring a transition curb. Plus you can choose cooling, gas heating or electric heat configurations, along with economizer, power exhaust and relief and fresh air damper options Conventional dehumidification systems reheat with natural gas or electricity—methods that aren’t acceptable under ASHRAE 90.1 energy standards. But thanks to innovative dehumidifi cation technology, the MagnaDRY™ design meets the ASHRAE 90.1 energy standard. It’s the one specification that solves the temperature/humidity problem with an efficient, energy-saving design for a wide range of applications.With more than a century of innovation behind our name, you can depend on York for year-round comfort and long-lasting durability. Built for years of trouble-free service and reliable operation, the MagnaDRY™ system is backed by a ten-year limited warranty on the heatexchanger, a five-year warranty on the compressor, and a one-year warranty on all other parts. That’s protection you can count on. Wouldn’t want to stay there. Neither would your customers. Conventional air conditioning systems can’t handle conditions when the temperature is moderate, but the humidity is high. In these cave-like conditions, users have only two options, and both are bad. They can either endure uncomfortably high humidity levels with a moderate room temperature, or they can lower the humidity level with the unwanted side effect of the space getting too cold.Instead of either-or, now you can meet temperature and humidity requirements with Magna DRY reheat series packaged units. Superior to conventional air conditioning dehumidification, Magna DRY units remove moisture and use a reheat mode of operation that doesn’t rely on expensive electricity or natural-gas. Because the Magna DRY design can remove moisture without increasing sensible cooling, you can maintain temperatures and humidity within the comfort zone without signifi cant added energy cost, Lower excessive moisture levels from open food containers and high occupancy loads to keep restaurant windows from fogging.Create comfortable humidity levels and avoid window condensation to make the waiting room more pleasant,Keep production lines going by maintaining proper humidity levels to prevent paper sticking together and to ensure ink dries properly,Prevent cold cases from fogging up so consumers can see products.Control dampness and odors by removing humidity from body heat and warm showers.Maintain proper humidity levels to keep dry food product from clumping in machinery.Maintain product quality and keep ingredients dry by avoiding under- or over-cooling.Curators can avoid high humidity levels to preserve valuable artwork, artifacts, and other valuable objects sensitive to high humidity levels.Handle heat and moisture build-up to keep areas from feeling muggy and uncomfortable.Remove excess humidity caused by body heat to prevent windows and mirrors from fogging and to minimize odor levels.